Once University of Missouri board members approve Gary Pinkel’s contract extension, Pinkel will sign it, however long it is and he will be apart of the Missouri Tiger football program for a long time. Despite the distractions of contract talk and Big 12 championships, Pinkel is focused on KU. He said last year was the "perfect storm." The number one team lost before the MU-KU game. The winner of this game would not only win the Big 12 North, but become the number team in the country. 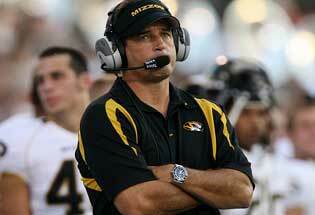 Still Pinkel says this year’s game is important to the players. The Tigers want to go into the Big 12 title game with a five game winning streak and they want to beat their rival for a third year in a row. The last time the Tigers pulled that off was 1986-88. Pinkel does talk about his first job search and the lack of faith his wife had in him after he got turned down at Kent State; pretty funny story. Pinkel also wishes nothing but the best for his offensive and defensive coordinators, Dave Christensen and Matt Eberflus who are rumored for different head coaching considerations around the country. Pinkel would support any decision they make. For that and more, click to listen to Gary Pinkel this week.